Stol is a paradise for paragliders. 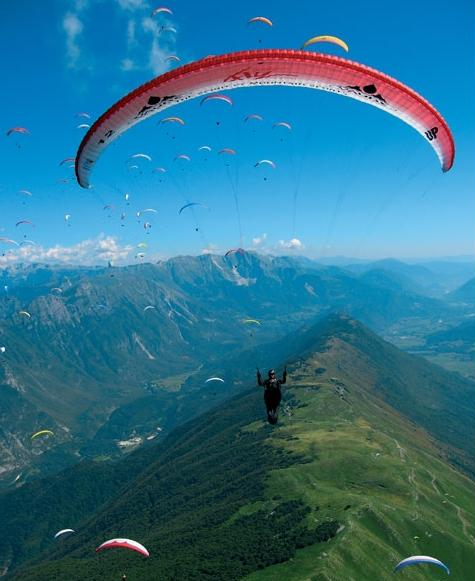 Its long ridge offers long flights and can be used for paragliding competitions (PWC Tour 1999, Slovenia open 2005, PWC Tour 2006, Hungarian XC Open 2007 in 2008, Slovenia open 2008, Outdoor-show 2009, Polish open 2009). Stol is the highest take off point in the Soča valley. Stol is usually above the inverted atmospheric layer and allows thermic paragliding. The prevailing wind is from the SW wind. The best conditions for longer flights are when you have week N or NE wind. Weak SW wind is ideal for local gliding. Start: A mountain meadow. Suitable winds: SE, S, SW.
Air space: allowed until 2900 m AMSL. The landing spot is near the campsite in Podbela. To arrive in Podbela take the road Kobarid – Staro Selo – Borjana – Podbela. It is forbidden to fly low over the village. Beware of electric wires near the campsite. The landing spot is the meadow by the petrol station at the south edge of town.